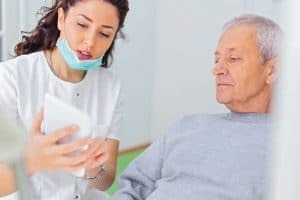 Where Can I Find Denture Repair In New York? If you wear dentures, they’re likely to need a repair at some point. You’ll want to get them fixed as soon as possible since you may not be able to eat or speak normally until you get a denture repair. Dentures are replacements for most or all of your natural teeth that can be removed and put back into your mouth. Full dentures have a base that fits over your gums, with an upper base as well as a lower one that accommodates your tongue. Partial dentures rest on a framework that attaches to your natural teeth, where they function like a bridge that can be removed. Why do dentures break or need repair? Dentures can break if you drop them or develop issues due to general wear and tear. Partial dentures may also break if you bite down to fit them into place, since this can bend the clasps that attach your dentures to your natural teeth. If your dentures aren’t fitting well, this can cause you to exert more pressure in a particular spot when you bite down. As a result, small fissures can occur, which might eventually grow into a larger crack. Dentures may also need adjustments from time to time to make sure they’re fitting comfortably. If your dentures are broken, need repair, or require an adjustment, you should see a dentist to get them fixed. Attempting to repair them yourself can be dangerous because over-the-counter glues contain harmful chemicals. You could also cause your dentures to fit incorrectly, leading to irritation and mouth sores. What is involved with denture repair? It’s likely that dentures will need to be repaired at some point. In addition, your mouth may change over time, but your dentures don’t change to accommodate these changes, so they’ll need to be adjusted. How can Dental365 help repair your dentures? Dental365 understands that when your dentures need repair, you don’t want to wait any longer than necessary to see a dentist. We have multiple convenient locations throughout the New York metropolitan area and are open seven days a week with extended business hours on weekdays. Our knowledgeable, experienced dentists and staff offer same-day denture repair on a walk-in basis or with an appointment. Our practice is dedicated to delivering the highest level of care at your convenience. If you’re in need of denture repair, contact Dental365 or stop by one of our many offices today. Fill out the form on this page to request an appointment or call 844-365-DENTAL to learn more.